Home Front Page Posts News Go Frogs Go! 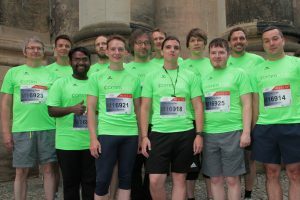 Like frogs awakened from dormancy, our runners started already in early spring to prepare for the race – theoretically setting up training schedules and practically by weekly to daily execution of training modules in rain or shine in the Dresden Heath. And they succeeded! All runners completed the 5 km race and crossed the finish line clocking personal bests of 21 to 34 minutes. Now it is time to relax and to take a deep breath … and start practice for the next Team Challenge. Still 364 days to go…!